Tar Sands Blockade is an all-volunteer horizontal, consensus-based organizing collective dedicated to working in solidarity with frontline communities most impacted by tar sands mining, transportation, and refining. We are funded almost entirely by the generosity of individual donors like you. Thank you! Our general fund is what we rely on for all our operational and day-to-day organizing expenses. Everything from our website and media tools to our training and organizing materials, to our action and logistical expenses: all depend on our general fund. Consider a generous contribution of $5, $50 or $500 today! 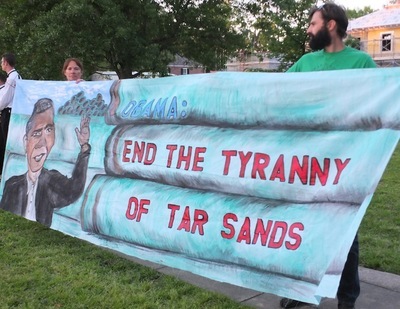 No one in the Tar Sands Blockade collective takes home a paycheck. All of our time is volunteered, so your donation really goes a long way. Every dollar goes directly to the projects, actions, and support work to which we are dedicated. Trust us, working within a shoestring budget over the last two years has taught us to navigate the capitalist world with efficiency and frugality. Nonetheless, until we build a movement strong enough to replace it with a system rooted in justice that meets all our needs, we are still gonna need to rely on grassroots donations like yours for support. Your contribution is building toward a future free from toxic tar sands. Thank you so much for your support! Contribute to a future free from tar sands! Maneesh Pangasa made a $10.00 donation. isabelann sprayregen made a $100.00 donation. Sharon Seifert made a $100.00 donation. Elizabeth J Hauser made a $19.00 donation. Lea Walters made a $25.00 donation. Aszani Stoddard made a $25.00 donation. Leora Weitzman made a $25.00 donation. herbert davis made a $20.00 donation. Monica Juarbe made a $10.00 donation. Desiree & Bo Martin made a $50.00 donation. Carol A Vinson made a $200.00 donation. troy w sanders made a $25.00 donation. Sharon Crocker made a $40.00 donation. My children and their children and their... made a $50.00 donation. Anne Keehnen made a $100.00 donation. Thomas Butler made a $25.00 donation. me made a $25.00 donation.